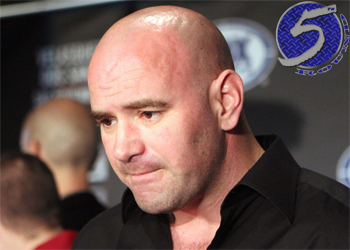 Late last year, UFC president Dana White (Pictured) promised to upgrade the production value in Strikeforce’s events. Did you notice the changes during Saturday’s Showtime broadcast? We didn’t either, and that’s because Showtime brass decided to turn a deaf ear to the “minor tweaks” White suggested for their live mixed martial arts shows. “I get the phone call from [Zuffa executive] Pete Dropick when I’m in Japan,” White revealed to MMAJunkie. “‘Yeah, listen, they’re not going to change pretty much any of the stuff you wanted.’ So I said, ‘[Expletive] them.’ You flew out to Las Vegas and wasted my time. Go talk your boxing [expletive] to somebody else. Zuffa, LLC, the parent organization of the UFC, purchased Strikeforce last March. When Strikeforce was stuck in a longstanding stalemate during contract negotiations with Showtime, White stepped in to ensure an extension was reached. After coming to terms on a guaranteed 12-month, eight-fight agreement in December, White professed to have big plans for Strikeforce because he was going to take on a more prominent role with his sister company. “I’ll never make that mistake again,” White stated. “UFC is what I am and where I should have been. I’m going to do what I’m contractually obligated to do [with Showtime]. It is unknown how this new friction will affect Strikeforce’s future with Showtime, particularly the fighters White didn’t transition to the UFC after convincing them they would be well taken care of because he was going to oversee Strikeforce. Showtime hosted the second event on their new deal last night, so we’ll probably have a clearer picture of Strikeforce’s fate after six more shows.